Buying Guide: Which second hand shops, what to look for and what does the grading system mean. 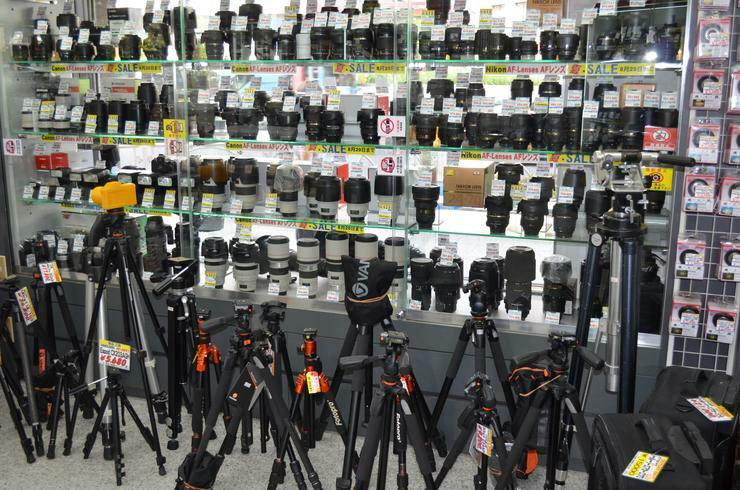 While Japan is certainly no cheap place to buy electronics there are a couple of reasons why you might want to consider purchasing photography equipment while visiting Tokyo, not least of which is the sheer organisation of the second hand market alongside tax free shopping for visitors. Knowing that the resale value will be preserved, Japanese users tend to take exceptionally good care of their kit. Add on to this the grading system used by the camera shops and you are looking at an enjoyable experience with few surprises. It’s also a haven for collectors with a smorgasbord of classic kit to be found. I recently needed to purchase a camera in Tokyo and having familiarised myself with the system decided that second-hand was the way to go. I had a budget of around $500, although I was prepared to go a little higher. I also had another couple of considerations: I wanted something suitable for work, that was not too bulky and it had to be light. The system is very clear. There are up to 6 categories employed: Like New (A) perfect condition, no signs of wear; Very Good (AB) limited use, works perfectly; Good (B) Some wear, works perfectly; Acceptable - fairly worn, works perfectly; Bad – does not work perfectly or has been damaged; and Junk - unusable. The last one seems odd, but is for people wanting to pick up parts or props. As the shops listed here are well-established you can trust that the descriptions provided by them are accurate. You can also trade in your old kit at all of these shops too. One thing to note is that if you take advantage of the on-the-spot tax reduction (currently 8%, set to rise to 10% in April 2017. You must have your passport to hand.) you will get a reduced warranty period from the shop - most likely just a week. However, if you’re only on a short visit it’s unlikely you would use the warranty outside of this time anyway. Most shops organise their equipment according to the manufacturer and split up the lens and the camera bodies. Some cameras come with a lens or in a box set. The equipment is kept in glass cabinets, but the staff are happy to get them out and allow you to play around and examine them upon request. One point to note is that (assuming you don’t speak Japanese) when you first ask if a staff member speaks English you may get a modest response of “a little” or “not really” I found that often this meant that they were actually pretty conversant in the language regarding cameras. I ended buying my camera in Sanpou Camera. The staff member got out a couple of compacts I requested to look at. He listened to what I needed, gently suggested I needed to go the DLSR route and then recommended two different cameras. One was out of my price range, but the other was exactly what I was looking for. The Nikon D3300 with an 18-55 VRII kit. Its polycarbonate body makes it super light and it’s small for a DLSR. One drawback is no WiFi, however as the staff member pointed out I could get round that by using a Wifi Memory card. I paid $550 including an 8GB WiFi memory card. Considering that it was boxed and A class this seemed like a fair deal. When I got it home I ran a check on it and discovered that it had a shutter count of just 27. The staff member was friendly, helpful, and even offered to put the camera on hold for me for a week so I could come back with my passport and claim the tax deduction. I decided against this and went for a six month warranty on it from the shop instead. It also has a worldwide 12 month warranty on the lens from Nikon. I’ve found it super easy to use and Sanpou did an excellent job of listening to my needs and finding me a good match. All in all I enjoyed the experience of looking for and buying the camera. Even as a relative novice I found staff were helpful, the shops well laid out and the kit on offer was fascinating. One note of caution, some of the local models don’t have an international OS, so make sure you check before you take the plunge. Which are the best second hand camera shops? This shop is a little out of the way, but worth it. Take the west exit from the station walk straight out and turn right onto the main road. Sanpou is on the left about a 10 minute walk away. There’s only one floor here, but there is a reasonable selection. They stock both new and used digital and film cameras and lens. The prices are generally lower than some of the other shops too and I found their service responsive and efficient. If you’re looking for something specific you can always go online first and check what they have in stock to avoid a wasted trip. Map Camera boasts 4 floors dedicated to cameras, lens and other equipment. It’s easy to locate being around 5 minutes away from the Shinjuku JR station. When you enter you will see Store Guide leaflets by the lift. Grab one. They have a breakdown of how the price tag/gradings work in English. Map Camera has an English speaking assistant available on every floor and I found them to pleasant, knowledgeable and helpful. The prices may be a shade higher than some other shops but the central location and the service does make this a solid choice. If you’re an enthusiast this tiny shop established in 1930 in Shinjuku has great selection of antique cameras which are worth nipping in to look at alone. They also have regular second hand DLSRs and some more unusual lens. They only grade by A – which is anything in the main display cabinets along the side, and B which is in the smaller cabinet to the right of the entrance. Don’t forget to check out the owner’s private collection of cameras and paraphernalia to the left of the counter too. The staff I spoke to spoke English and you can also check out their website (Japanese only) to see what they have in stock. This shop had a reasonable selection of cameras, both digital and film, and the staff had limited English. I was surprised that when I asked about the shutter count on a Nikon D330 they said they weren’t sure how to check. However I was really impressed when they cheerfully accepted my guidance to check it using the Nikon site. Brownie points just for being nice and flexible. Closest Station: Iwamoto (Toei Shinjuku Line) Akhibara (Tokyo Metro) Akhibara (JR - ten minute walk). This shop carries a smaller collection of DLSRs but specialises in 35mm cameras. It’s a single floor affair with a good selection of peripheral kit. The labelling here is all in Japanese, but the staff is also accustomed to the A/AB system mentioned above. Do note that this shop does not offer the tax discount. All prices on the labels are tax inclusive. The owner speaks limited English, but certainly enough for the purpose.